Should I practice this some more? Or I can just play it already? This kind of question comes up a lot when playing an instrument as challenging as classical guitar. Notice I said "playing" classical guitar. That's how we refer in public to what we do. If someone asks 'What instrument you "play?, you reply with "I play classical guitar." No-one ever asks you what instrument you practice. But to be truthful, if you're serious about "playing" most of your time with the guitar is actually supposed to be spent "practicing." Or so they say. Practice and Play are two sides of an internal battle in our lives as guitarists. On one extreme is the widely-held idea that you need to spend tedious practice time "getting the notes" before you're ever allowed to have any fun playing. You're supposed to do this so you don't "practice in any mistakes." On the other extreme is the desire to just play through your pieces, over and over and over again, hoping they'll magically get better, even if you're blithely ignoring mistake after mistake. Let's imagine a battle: The battle between practicing and playing. Let's line up the battle forces. Practice, Practice, Practice On this side of the divide are the neverending champions of perfection, the note police. They are the "get the notes right" enforcers, always watching over you with a red pencil of shame. Sometimes we associate the note police with our teacher, feeling self-conscious about mistakes when we play for him or her. Their mission: eradicate all wrong notes, all technical ineptness, all playing outside the lines, each and every squeak, every scrap of fingernail noise... plus anything and everything else you are doing wrong, wrong , wrong. You enable them when you police yourself relentlessly, commanding and interrogating your notes, your music, your technique, your hands and fingers and nails, every time you practice, until you become so stiff and fearful that you couldn't express yourself if offered a million bucks as a reward. Play, Play, Play! On the other side are the "sloppiness is my form of self-expressionists", or expressionistas for short, fighting for their right to party. They form an army of sloppy, music-drunk archers, defending their need to express themselves fully. twanging notes out in the general direction of the staff, hitting it often enough call it music if you don't listen too closely. Every time you take the espress-yourself-lane through the music, running roughshod over the technical details, you are giving the expressionistas an inch which they will stretch into a mile. If you ever notice how sloppy you've gotten, it can be ever-so-hard to call the note police to rescue you. They will not go easy on your indiscretions, and you can lose heart quickly in the harsh light of their perfectionism. The true magnitude of their war on mistakes is staggering and endless. Rarely do these two sides ever cooperate with each other. Sometimes the cruel and self-deflating "note-police-force" wins out. Sometimes the ecstatic and self-convincing expressionistas win out. What side do you tend to fall on in this imaginary battle? When you sit down to practice, do you actually spend more time "playing?" At its worst this means just rushing through one piece after another, temporarily "fixing" (but not really) a few blaring errors before moving on to something more fun. Or do you spend more time "practicing," At its worst this means stopping in the middle of nearly every bar to give yourself a traffic ticket, waiting for the ok from note police headquarters before daring to move on. Will this really never end? Do the note-police-force and the expressionistas always need to be egging each other on in your brain, denigrating each other, taking cheap shots at each other, blasting each other in and out of your consciousness? Will they ever get along? Ok. Take a deep breath. Release it loudly and expressively. Just describing this sorry battle is making me feel way too tense. Let's look at how it can be turned into something more constructive. Do practicing and playing have to be so polarized? First off, I want to help you redefine your notion of the term "polarized." When we say two things are polarized, we are talking about an extreme, battle-ready polarity. But a polarity doesn't have to imply a battle, like good versus evil, dark versus light, stupid versus smart. 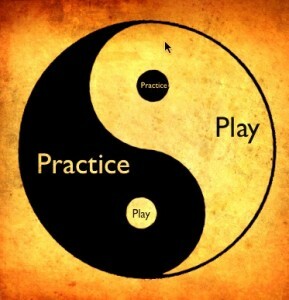 Defining practice and play (or anything, for that matter) as such an extreme polarity is rarely healthy or productive. A polarity is best seen as a useful concept, like yin and yang. We can use the concept of polarity to gain insight into how two seemingly separate things are really related, and actually part of a larger whole. 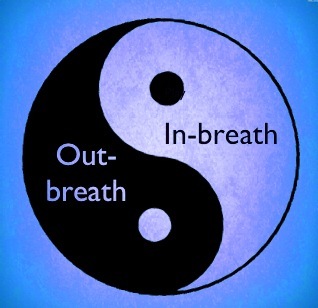 Breathing, for instance, is a polarity. You breath in, you breath out. Yes, they are opposite. And they feed each other. One needs the other. If you stopped breathing oxygen in you'd die. If you stopped breathing CO2 out you'd also die. Your inbreath and your outbreath are dependent on each other like you are dependent them...for life. Can we say the same thing about Practice and Play? Yes, we can. Practice and play need each other. They can work together, and in fact they do work together, all the time, naturally. They feed and nourish each other, just like your inbreath and your outbreath. Put simply, you practice so you can play. When you play, you find out what you need to practice more. Without one you wouldn’t have the other. Jay, I found the article on play and practice encouraging. It make me recognize that I don’t have a note policeman in my life, and that is odd because raised in an Irish Roman Catholic environment, guilt and internal policing are part of my being. 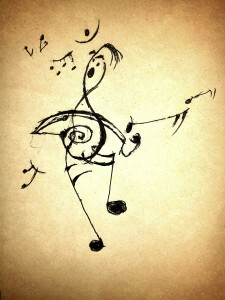 With guitar, though, it is different. Sure I am dissatisfied when I don’t get the sound right but that is because of a respect for the beauty and flow of the music and not from any personal standard of perfection. So I am happy torealize I am not really bothered by this tension of play/practice. 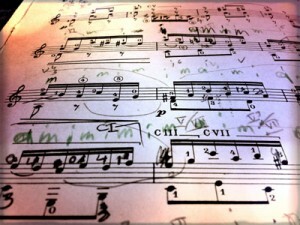 Having said that, I do often feel stuck in the practice mode and wish I could just enjoy playing more — without mistakes! Mark, I’m glad you found it encouraging. I like what you say about respect for the beauty and flow of the music, and it sounds to me like you have a healthy attitude towards mistakes. Good luck in the quest to make less of them—nothing wrong with that! I come in on the side of the expressionistas. Rarely do classical artists feel that they got it right; that includes the top most. But they say the few times that it happens in their careers makes it all worthwhile. Michael Jordon said he lost way more than he won. Anyone on this planet can miss a free throw. Even in this age of recording when we think we can work at it till we nail it, and capture the perfect final result, we can be deluded. The story goes that aboard ship a great conductor heard a performance over the radio of one of his favorite compositions. One that was close to his heart. “It’s too slow!” He bellowed in frustration. 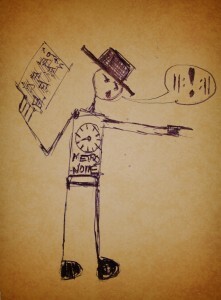 “What an idiot for a conductor!” It turned out to be a recording he had “perfected” in the studio. I myself have finished a performance thinking it had been a disaster and found out later that the beauty of my performance that night was the cause of an individual devoting his life to the guitar. If you really are determined to do it perfectly, however, here is the secret: don’t play too fast, too slow, too loud, or too soft. Have lots of luck and work hard. I love that story, thinking it was a disaster only to find out that someone was profoundly moved. We classical guitarists are much too hard on ourselves! The more we work at primarily eliminating mistakes the more sensitive we get to every last glitch and forget that there’s something else being communicated and that this is actually more important. I went to a concert of a master bandoneon player a few months ago in which a friend was playing viola, (also masterfully and gorgeously) enjoyed it a great deal, along with the audience—and didn’t even realize that his instrument was broken, only one register was working, half the lines were missing, meaning that he and the rest of the musicians were struggling like crazy to keep it together and thought it was a near disaster. It wasn’t. But try convincing them of that.